Preparation time: 15 minutes. Cooking time: 15 minutes. Chilling time: 1 hour. Bring water to a boil over high heat in a 1-quart saucepan. Add pasta and cook according to package directions until tender (about 12 minutes). Rinse in colander under cool running water to stop cooking process, then drain well. 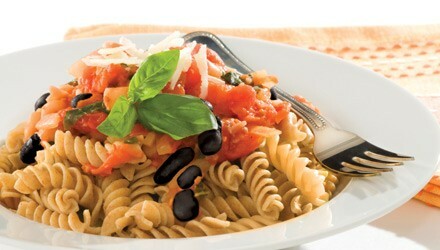 Place pasta in a medium-size mixing bowl. Add black beans and tomato. Slice the cheese stick horizontally to make thin, circle-shaped pieces and add to bowl. Add salad dressing, parsley, and garlic powder and toss well. Place in a serving bowl, and garnish with chopped green onion. Chill for one hour before serving. Exchanges per serving: 1 carbohydrate, 1/2 lean meat. Carbohydrate choices: 1.